Inflation describes an increase in the overall price level of goods and services within an economy over a certain period. As a consequence, the purchasing power of money decreases, which means the money essentially loses some of its value. Thus, inflation has an impact on the cost of living and the development of the economy as a whole. 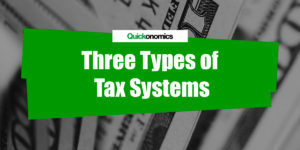 Starting from there, we can identify three main types of inflation: demand-pull, cost-push, and built-in inflation. We will look at each of them in more detail below. Demand-pull inflation occurs when the overall demand for goods or services increases faster than the production capacity of the economy. This situation leads to a demand-supply gap (i.e. a shortage) which results in an increase in price (see also the law of supply and demand). To illustrate this, we can look at a simple supply and demand diagram. As you can see in the illustration below, an increase in demand causes the aggregate supply curve (AD) to shift to the left (i.e. up). However, the aggregate supply curve (AS) doesn’t change. 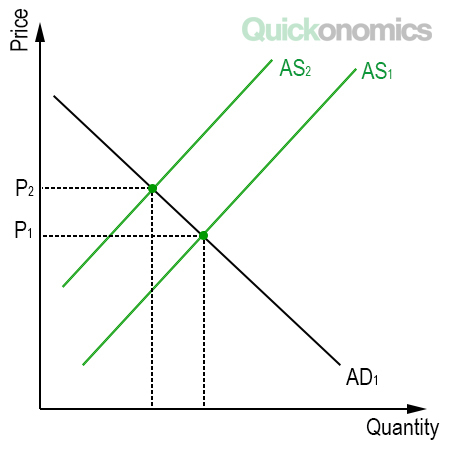 Therefore, the new equilibrium price (P2) at the new intersection of AS and AD is higher than the old price (P1). Hence, as the name suggests, demand-pull inflation is caused by a shift in demand. A popular example of demand-pull inflation is the oil industry. Over the last decades, the demand for oil has increased significantly. However, oil is a scarce resource, so there is only a limited amount available on our planet. Thus, demand has increased more rapidly than supply, and as a result, a barrel of oil costs almost three times as much today as it did 20 years ago. Because oil is such a precious resource, this price increase had an important impact on overall price levels within the economy, as it caused demand shifts and changes in the prices of related goods. Cost-push inflation occurs as a result of an increase in the cost of production. That is, when the prices of inputs (e.g. raw materials, labor) increase, the production of goods or services becomes more expensive and producers need a higher price to be profitable. 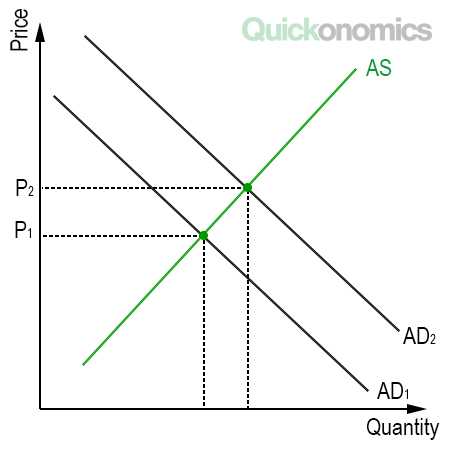 Going back to our supply and demand diagram we can see that the higher input prices cause the aggregate supply curve (AS) to shift to the left, whereas the aggregate demand curve (AD) doesn’t change. As a result, the price level increases from P1 to P2. So unlike demand-pull inflation, cost-push inflation is caused by a shift in supply. Again, one of the most popular examples of cost-push inflation can be found in the oil industry. Particularly, in the 1973 oil crisis, which is also known as the first oil shock. 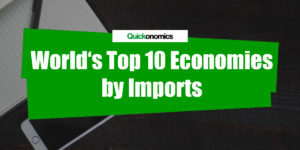 This crisis was triggered when the members of the Organization of the Petroleum Exporting Countries (OPEC) proclaimed an oil embargo, which resulted in a sudden supply shock (i.e. a sudden decrease in the oil supply). As a result, the price of oil globally surged from USD 3.00 to USD 12.00 per barrel, without a change in demand. Last but not least, built-in inflation is caused by expectations of future inflation. That means, when prices rise, workers expect (and demand) higher wages to maintain their cost of living. However, higher wages result in higher costs of production, which lead to higher prices, and the spiral begins. Because of this circular dependence, built-in inflation is sometimes also referred to as the wage-price spiral. 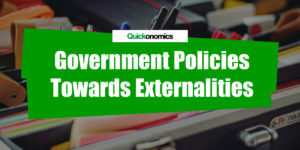 However, at this point, it is important to note that the expectations that cause built-in inflation always originate from either persistent demand-pull or significant cost-push inflation in the past. In other words, built-in inflation doesn’t occur on its own. It always needs a catalyst or a trigger to kick it off. Inflation describes an increase in the overall price level of goods and services within an economy over a certain period. There are three main types of inflation: demand-pull, cost-push and built-in inflation. Demand-pull inflation occurs when the overall demand for goods or services increases faster than the production capacity of the economy. Cost-push inflation happens as a result of an increase in the cost of production. And last but not least, built-in inflation is caused by people’s expectations of future inflation.